Not to be confused with Maouri people or Mauri people. For the Māori people of the Cook Islands, see Cook Islanders. The Māori (Māori pronunciation: [ˈmaːɔɾi], /ˈmɑːʊəri/) are the indigenous Polynesian people of New Zealand. 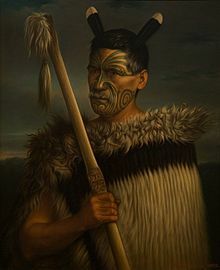 The Māori originated with settlers from eastern Polynesia, who arrived in New Zealand in several waves of canoe voyages at some time between 1250 and 1300 CE. 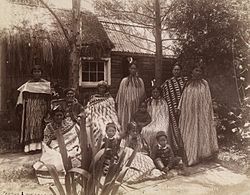 Over several centuries in isolation, the Polynesian settlers developed a unique culture that became known as the "Māori", with their own language, a rich mythology, distinctive crafts and performing arts. 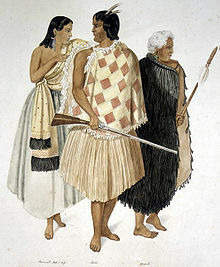 Early Māori formed tribal groups, based on eastern Polynesian social customs and organisation. Horticulture flourished using plants they introduced, and later a prominent warrior culture emerged. 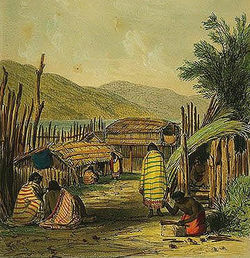 The arrival of Europeans to New Zealand starting from the 17th century brought enormous change to the Māori way of life. 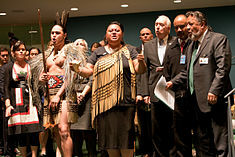 Māori people gradually adopted many aspects of Western society and culture. 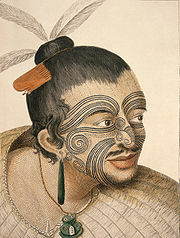 Initial relations between Māori and Europeans were largely amicable, and with the signing of the Treaty of Waitangi in 1840 the two cultures coexisted as part of a new British colony. Rising tensions over disputed land sales led to conflict in the 1860s. 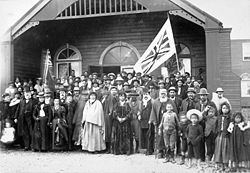 Social upheaval, decades of conflict and epidemics of introduced disease took a devastating toll on the Māori population, which went into a dramatic decline, but by the start of the 20th century the Māori population had begun to recover, and efforts were made to increase their standing in wider New Zealand society. 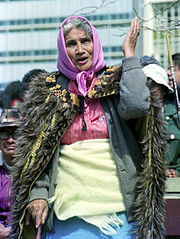 Traditional Māori culture has enjoyed a revival, and a protest movement emerged in the 1960s advocating Māori issues. In the Māori language the word māori means "normal", "natural" or "ordinary". In legends and oral traditions, the word distinguished ordinary mortal human beings—tāngata māori—from deities and spirits (wairua);[i] likewise wai māori denoted "fresh water" as opposed to salt water. There are cognate words in most Polynesian languages, all deriving from Proto-Polynesian *ma(a)qoli, which has the reconstructed meaning "true, real, genuine". The earliest period of Māori settlement is known as the "Archaic", "Moahunter" or "Colonisation" period. The eastern Polynesian ancestors of the Māori arrived in a forested land with abundant birdlife, including several now extinct moa species weighing from 20 to 250 kilograms (40 to 550 lb). Other species, also now extinct, included a swan, a goose and the giant Haast's Eagle, which preyed upon the moa. Marine mammals, in particular seals, thronged the coasts, with coastal colonies much further north than today[update]. At the Waitaki river mouth huge numbers of Moa bones estimated at 29,000 to 90,000 birds have been located. Further South, at the Shag River mouth at least 6,000 moa were slaughtered over a relatively short period. European settlement of New Zealand occurred in relatively recent[update] historical times. New Zealand historian Michael King in The Penguin History Of New Zealand describes the Māori as "the last major human community on earth untouched and unaffected by the wider world." 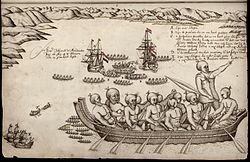 Early European explorers, including Abel Tasman (who arrived in 1642) and Captain James Cook (who first visited in 1769), recorded their impressions of Māori. Initial contact between Māori and Europeans proved problematic, sometimes fatal, with several accounts of Europeans being cannibalised. The decline of the Māori population did not continue, and levels recovered. By 1936 the Māori figure was 82,326, although the sudden rise in the 1930s was probably due to the introduction of the family benefit − only payable when a birth was registered, according to Professor Poole. Despite a substantial level of intermarriage between the Māori and European populations, many Māori retained their cultural identity. A number of discourses developed as to the meaning of "Māori" and to who counted as Māori or not. 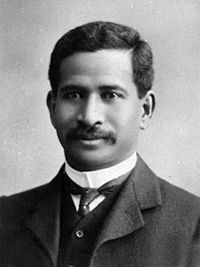 Māori actors and actresses are present in many of Hollywood's productions for being able to portray Asians, Latin Americans and Arabs because of their resemblance. They are in films like Whale Rider, Star Wars: Revenge of the Sith, The Matrix, King Kong, The River Queen, The Lord of The Rings, Rapa Nui, and others, and famous television series like Xena: Warrior Princess, Hercules: The Legendary Journeys, The Lost World[disambiguation needed] and Spartacus: Blood and Sand. Famous Māori actors and actresses include Temuera Morrison, Cliff Curtis, Lawrence Makoare, Manu Bennett and Keisha Castle-Hughes. In the 2013 Census, 598,605 people identified as being part of the Māori ethnic group, accounting for 14.9% of the New Zealand population, while 668,724 people (17.5%) claimed Māori descent. Most Māori also have at least some Pākehā ancestry, resulting from a high rate of intermarriage between the two cultures. Under the Maori Affairs Amendment Act 1974 a Māori is defined as “a person of the Māori race of New Zealand; and includes any descendant of such a Māori." Wider commercial exposure has increased public awareness of the Māori culture, but has also resulted in several notable legal disputes. Between 1998 and 2006, Ngāti Toa attempted to trademark the haka "Ka Mate" to prevent its use by commercial organisations without their permission. In 2001, Danish toymaker Lego faced legal action by several Māori tribal groups (fronted by lawyer Maui Solomon) and members of the on-line discussion forum Aotearoa Cafe for trademarking Māori words used in naming the Bionicle product range – see Bionicle Māori controversy. ^ a b c Statistics New Zealand. "2013 Census QuickStats About Māori". Retrieved 20 December 2013. ^ "Maori". Oxford English Dictionary (3rd ed.). Oxford University Press. September 2005. ^ Entwisle, Peter (20 October 2006). "Estimating a population devastated by epidemics". Otago Daily Times. ^ Pool, D. I. (March 1973). "Estimates of New Zealand Maori Vital Rates from the Mid-Nineteenth Century to World War I". Population Studies (Population Investigation Committee) 27 (1): 117–125. doi:10.2307/2173457. PMID 11630533. ^ Thompson, Christina A. (June 1997). 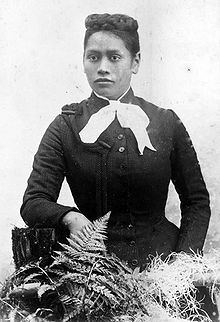 "A dangerous people whose only occupation is war: Maori and Pakeha in 19th century New Zealand". Journal of Pacific History 32 (1): 109–119. doi:10.1080/00223349708572831. Retrieved 15 June 2008. "Whole tribes sometimes relocated to swamps where flax grew in abundance but where it was unhealthy to live. Swamps were ideal places for the breeding of the TB bacillus." 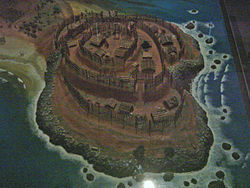 ^ "Māori – Urbanisation and renaissance". Te Ara Encyclopedia of New Zealand. "The Māori renaissance since 1970 has been a remarkable phenomenon." ^ James, Colin (6 September 2005). "Colin James: Ethnicity takes its course despite middle-class idealism". The New Zealand Herald. Retrieved 19 October 2011. ^ Schwimmer, E. G. "Warfare of the Maori". Te Ao Hou, No. 36, September 1961. 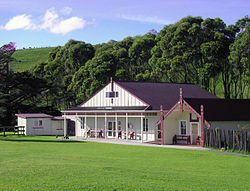 ^ "Te Kotahitanga – the Māori Parliament". Ministry of Women's Affairs. 16 September 2010. Retrieved 5 November 2010. Howe, K. R. (2003). 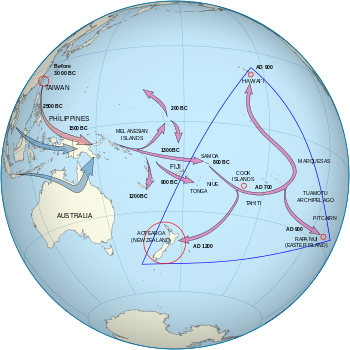 The quest for origins: who first discovered and settled the Pacific islands?. University of Hawaii Press. ISBN 0-14-301857-4. King, Michael (1996). Maori: A Photographic and Social History (2nd ed.). Auckland: Reed Publishing. ISBN 0-7900-0500-X. King, Michael (2003). The Penguin History of New Zealand. Penguin. ISBN 0-14-301867-1. Lashley, Marilyn E. (2006). "Remedying Racial and Ethnic Inequality in New Zealand: Reparative and Distributive Policies of Social Justice". In Myers, Samuel L.; Corrie, Bruce P. Racial and ethnic economic inequality: an international perspective, volume 1996. New York: Peter Lang. ISBN 0-8204-5656-X. Mead, Hirini Moko (2003). Tikanga Māori: living by Māori values. Wellington: Huia Publishers. ISBN 1-877283-88-6. Orange, Claudia (1989). The Story of a Treaty. Wellington: Allen & Unwin. ISBN 0-04-641053-8. Sorrenson, M. P. K (1997). "Modern Māori: The Young Maori Party to Mana Motuhake". In Sinclair, Keith. The Oxford Illustrated History of New Zealand (2nd ed.). Oxford University Press. ISBN 0-19-558381-7. Ballara, Angela (1998). Iwi: the dynamics of Māori tribal organisation from c. 1769 to c. 1945. Wellington: Victoria University Press. ISBN 0-86473-328-3. This page was last modified on 4 August 2014 at 17:22.